Actions Alarms commitment to security spans over many regions. Working closely with the local Police is paramount in targeting crime and its reduction. Action Alarms have recently been requested by Nottinghamshire Police to help support a CCTV vehicle. 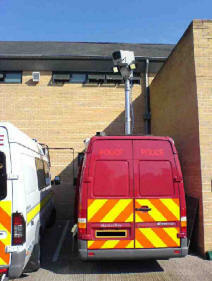 This vehicle is fitted out with high specification CCTV equipment and can be deployed quickly across the area. Nottinghamshire Police realised Action Alarms experience with CCTV and partnered to help maintain the vehicles sophisticated equipment. Action Alarms managing director Malcolm Sheppard quoted ‘We see this as an instrumental opportunity to support our local Police in crime reduction’.